In this stage i guess you have had at least one blog that you proud of. You think that your blog has enough content and visitor to be considered as a partner of Google AdSense. You want to submit for Google AdSense application right away; or even it is only one click away from the submission, but you have a slight hesitation and reconsider it. I've a gooogle AdSense full approved account since last month. I took more than 5 years since my first click on submitting Google AdSense application. Why did it take so long to get approval?I will share my bad experience during the process of Google AdSense application with the hope that you can prevent the same mistake i did. I had bad experience in submitting blog for Google AdSense application. At that time i just want try Google AdSense application. I have a blog talking about photography. There were several post in my blog, most of them contain my photographs. I did not take Google AdSense application seriously. You can guess that my first application was rejected because my blog did not have enough content. Just make sure before that you enough quality post before submitting Google AdSense. Improve the blog before rejection is much easier than improve the blog after rejection. If our blog has the qualification for AdSense, it will be approved in a short time. But, if our blog has some issue about the content, the policy, and other issue, our blog will be rejected right a way. The page navigation is also a must. I've some experience in submitting Google AdSense application. It takes quite long time for my application to be approved. I was submitting nu-complete blog with a few post, using blogspot domain, bad navigation and layout. Google was still reviewing my application and reject it. Google gave me the reason of rejection. I try to improve my blog bit by bit and it takes longer time for Google to review my blog improvements. Just be patient when it is happen. Keep writing good quality post while waiting. 6. Google AdSense approval is only the the first step in money making, generating traffic is the next. While waiting for Google AdSense approval that can takes months, it is better to keep creating quality post and generating traffic. In the end of the day, we want to get visitor coming to our blog. The visitor will not visit our blog if we don't have enough quality post. You must make your blog/web become friendly with Google Bot. Google will crawl our blog to review our application. Help Google in crawling our web by providing the site map. You can search how to create a site map in Google. It is good to ask opinion from others blogger about the blog that you want to submit. Our view is limited. By having others people opinion, we can get feed back to improve our blog. The Google AdSense policy is very important. We should read it to make sure that the requirement is adequate. Below is the link. I believe it will be very difficult to read such long paragraph. But we have to read it to avoid rejection because we do not follow the Google AdSense policy. Below is the link of Google AdSense policy. We want to get approval from Google for Google AdSense account. So it does not make sense to show other advertisement during this application process. 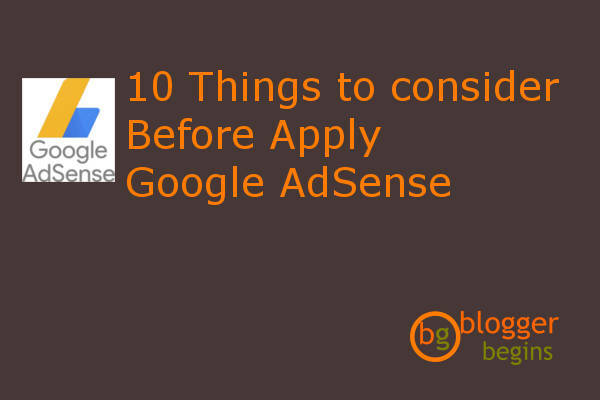 I hope by reading this 10 things to consider before submit Google AdSense you can make you blog ready before submitting Google AdSense application. Please let me know your thought on the comment section below. 1 Response to "10 things to consider before submit Google AdSense"